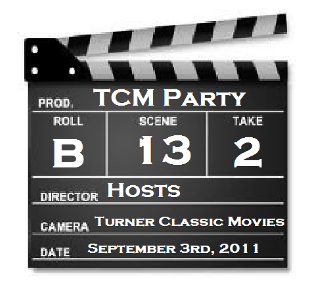 Some of you may know that I run #TCMParty, a live tweet of movies shown on TCM, but you may not know that today, September 3, 2012, is the one year anniversary of the first-ever TCM Party. While I wasn’t present on that occasion, I did start tweeting along soon afterwards, on September 11, 2011. 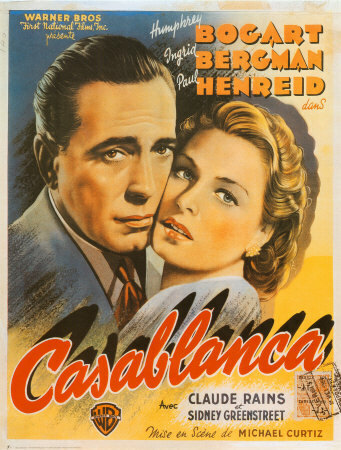 The film was Casablanca. I remember my first ever #TCMParty tweet was something like, “Bring out the private stock,” or words to that effect. 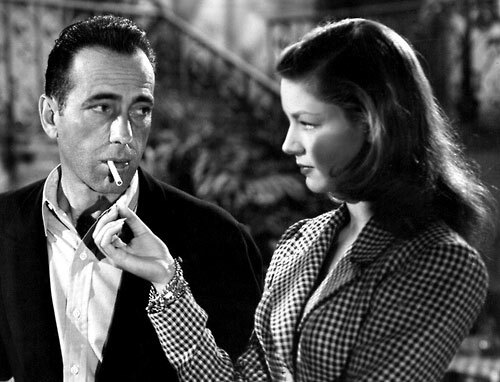 #TCMParty was actually the brainchild of Kathleen Callaway, aka @hockmangirl. A group of her friends on Twitter were tweeting along to classic movies, so she figured, why not use a hashtag so everyone could see everyone else’s tweets. She began “hosting,” i.e. picking a specific movie from the TCM schedule, promoting the date and time it would be on to get as many people together as possible, and tweeting information about it during the air time. I started hosting TCM Parties sometime in October, and soon after decided we needed a separate Twitter account, so we wouldn’t blow up our followers’ feeds while we were feverishly tweeting about a movie some of them might not care about at all. If you’ve ever wondered why there’s an underscore in @TCM_Party, it’s because @tcmparty was taken. We also started a Facebook page and a tumblr, which are still going strong. I’d like to thank everyone who has “attended” our virtual shindigs, helped get the word out, and/or guest-hosted over the past year. So…what’s your favorite #TCMParty memory? Posted on 3 September 2012 13 March 2013 by PaulaPosted in FeaturesTagged TCM, TCM Party. Of course I’m partial, but I really enjoyed #TCMParty’s tweeting during “Boomerang!” starring Dana Andrews. It’s rarely on TCM and it’s one of Andrews’s best performances in a rather demanding role. He’s practically in every frame of the movie and his scenes in court were pretty amazing. Thanks for hosting; TCMParty’s are always fun. Brilliant idea and tons of fun!! Not only does it promote TCM and classic film, it’s helped strengthened the classic film fan community on twitter and beyond. I can’t choose a specific day or film I’ve enjoyed more than others although I’m lucky to have been asked to host a few times so THANK YOU, Paula for the opportunity. I will add that sometimes the worst the movie is the more fun the tweet-a-long is. We have snark experts that are a riot. Finally, perhaps what shows how great the TCMparty idea was, is that although it’s great to have a formal host, it is now a daily ritual where we all know we can go to to discuss any movie that’s being shown on TCM at any time. This is particularly significant since not all coordinated parties fit international film fans’ schedules. So there! I’m a huge fan, join in as often as possible so a KUDOS to you, Paula and the community this brings together. It’s here to stay now! I had no idea TCM Party and I shared a birthday. How Fabulous!! I love TCM Party so much. It’s my favorite way to watch movies. I really don’t remember my first time….But it was fun at last years TCMFF to have people introduce me to others as EliseCD, from twitter. Hope to spend many more TCM Parties with all of you. Happy Birthday TCMP!! I would love to join in on the fun at some point, I always see the hashtags on Twitter and you guys seem to have a lot of fun. Well done Paula! #TCMParty has changed the way I watch TCM. In past years, if the channel was airing a film I had seen many times, I might not tune in. Now I will, because I know there will likely be a fun and engaging dialogue going on about it under the #TCMParty hashtag. And I love that, at pretty much any hour of the day or night, there’s usually somebody tweeting. I also appreciate that there are no “rules” or expectations from participants. In other fan communities there can be litmus tests – if you haven’t seen (blank), or if you don’t know (blank), you’re not a REAL fan. No such thing here. The person watching CASABLANCA for the first time is just as welcome as the buff who has seen it 100 times. This is a witty, informed, welcoming group. And I’m happy to be part of it. We do say “boo” to litmus tests! Thanks Will for your kind words and for your help and patience over the past year. You are one of the TCM Party essentials…fabulous Partier and super-knowledgeable guest host. Of course there wouldn’t have been a hashtag to tweet at all hours of the day and night if you hadn’t created the party in the first place. It’s been fun, educational, given me an outlet for my “class clown” tendencies, and introduced me to a bunch of fellow movie fans I probably never would have met otherwise. Thanks for a great year and here’s to many more! Overall, I just appreciate that TCMParty is always there to share movies with. But I think my proudest, most astonished moments were when TCMParty gathered for the Ishiro Honda and Toshiro Mifune screenings–and seeing both Godzilla and Rodan trend. Congrats Paula. I don’t get TCM in my cable service 😦 but if I did, I’d love to join in on the party! One of my fave memories, well, I have 2. Watching The Adventures of Robin Hood and everyone talking about Maid Marion’s hair and outfits. LOL. and then, watching Life with Father…the whole film was just so much fun to watch with everyone else. Thanks T! I’m so glad you enjoyed and hope you can stop back by soon 🙂 To be fair, there was a lot of discussion of Errol Flynn as well 😉 I definitely enjoy watching my faves with others…even a movie I’ve seen many times 🙂 Thanks again T! Happy Birthday to TCM Party! Been alot of fun seeing you guys celebrating the classics. I hope you continue to keep the TCM love going! All the best. My favorite #TCMParty moment was when I guest-hosted my first every #TCMParty. The movie was The Third Man. A great post-war drama with terrific cast including Joseph Cotton and Orson Welles. I was a little anxious about guest-hosting and Paula told me to just have some material prepared to fill in the gaps. So I diligently prepared a few days ahead some nuggets about the lead actors, the setting, the plot, etc. Then, almost from the opening credits all the tweets were focused on two things: the zither music that pervades the movie and the dutch angles (which also pervade.) At first I thought fellow partiers would get these tweets out of their system and move on to the beauty of this great film. Alas, it was not to be…I tried interjecting my prepared material but the mob (er…party) continued with their zither-rific commentary. Paula asked me the next day how it went…and I cried on her shoulder a little. She reassured me that sometimes that just happens. I look back on that now and laugh…because I’ve realized it’s a group thing, not an individual thing. I have great joy guest-hosting and tweeting along as a ‘participant’. I love to see new faces popup, or folks tweet “I’m so glad I found the #TCMParty hashtag.” That’s great that new people continue to ‘find’ the party and tweet along.